Cleaning fish is probably the least enjoyable part of the catch-clean-cook-eat process, but it must be done. If you learn the best methods and use the right tools, cleaning fish is much easier than it might otherwise be. And it's important to get it right - after all, you’re going to eat it. So here we'll take a look not just at the cleaning and gutting techniques, but also at the preparation for cooking. First though, the fish must be killed quickly to avoid any unnecessary suffering. Hit it on the head with something hard and heavy. This is fine if you're ashore, but not so good on a boat - particularly with a large fish. Not only will it take several solid blows to get the job done, you're likely to damage the boat - and yourself! Pour or squirt a little alcohol directly into the fish's gills not your best malt, any old rot gut will do the trick. This will be absorbed almost instantly into the bloodstream and will rapidly cause brain-death. It's a clean and humane method, and is the one I use most. Feel free to use a drop more to toast the fish's passing! Why would you want to do this? Well, if your catch is a hard-fighting gamefish and has had to endure a long, hard struggle before you managed to land it, lactic acid will have built up in its muscle fibre, which can potentially taint the taste of the flesh. This is particularly true of tuna. Bleeding the fish immediately after killing it - preferably before its heart stops beating - will remove any such taint. All sushi grade fish is bled in this way. Finally, make a shallow cut between the finlets at the tail-end of the fish. This will probably be less productive blood-wise than the cuts in the other regions. Blood should now be flowing freely from each of these cuts. If it isn't, make the cuts deeper, or longer, or in a slightly different position until it is. 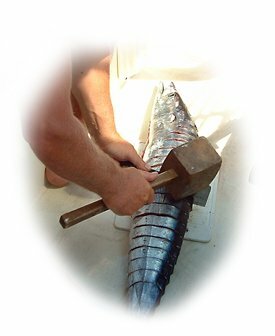 Small fish like atlantic mackerel should be clubbed smartly on the head, and have their throat cut below the gills. Swill them around in a bucket of seawater until the blood stops flowing. Ocean gamefish are conveniently equipped with a narrow, wrist-like tail section and a strong, broad caudal fin (the tail fin) which enables you to safely hitch a tail rope around them. Do this now and tow it astern for 10 minutes or so to let the fish bleed out. Watch out for sharks! Use these ten minutes to wash down your cockpit, which will be looking rather colourful. Always wear a cut-proof fishing glove when cleaning fish - obviously on the hand that isn't holding the knife (yes, I've seen it done). These are constructed with a cut-resistant stainless steel core wrapped in a high-tech polyester and vinyl material. Sharp points will penetrate them but a slicing blade won't. I've been very thankful that I was wearing one of these on more than one occasion when cleaning fish. But back to the job in hand. With the fish lying limp and bloodless, and with your tools for cleaning fish to hand, you can now begin gutting the fish. You'll need to remove the fish's internal organs first, as the bacteria living in the gut will rapidly cause the flesh to deteriorate if you don't. Cleaning fish can be a messy business, but with practice this method of cleaning fish will make light work of it. First though, decide how you want to prepare your fish for the table. Why? Well, if you choose to fillet it, you won't have to bother with the fish cleaning bit. Otherwise there are various parts of the fish you'll need to remove. You're going to need a finely honed filleting knife for this, together with some means of keeping that edge razor sharp. Some fish lend themselves more to the filleting approach than others. It's largely a matter of body shape. Laterally compressed fish (that's when they look tall and relatively slim when viewed head on - or wide and very slim in the case of flatfish) are ideal candidates, whilst round sectioned fish like tuna and wahoo for instance are best steaked - that's sliced into cutlets. Not only is there no need for cleaning fish at all if you fillet them, if you go on to skin the fillet, you won't need to scale them either. And the easiest fish of all to prepare? Skates and rays. Cleaning squid, octopus and cuttlefish is a straightforward affair too - once you know how to do it. Finally, use your knife to complete the cut right through each of the steaks. Scale it, gut it, remove the gills if you're leaving the head on, and grill it on the barbie. A perfect approach for pan-sized fish. Have your say about what you've just read! Leave me a comment in the box below. 10 Top Sailboat Fishing Tips to Keep You and Your Crew Well-Fed! 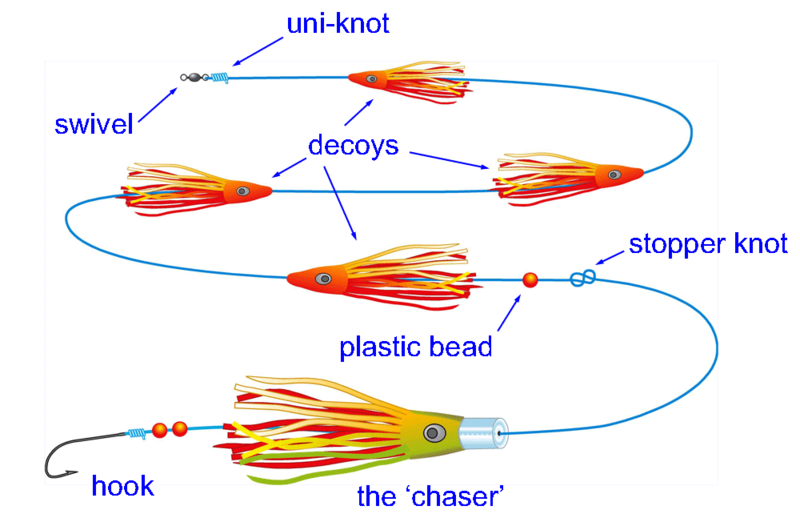 A daisy chain is simply a string of teasers rigged line-astern of your trolling lure. But how is it that these decoys can make such a difference to your catch rate?